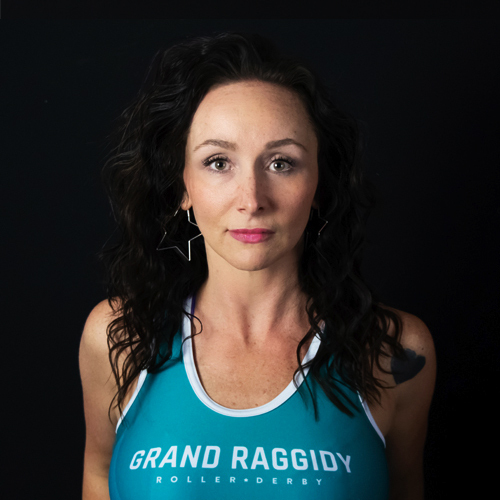 The 2019 Grand Raggidy Roller Derby opener kicks off this Saturday, March 23, as they enter their fifteenth season hosting Royal City Roller Derby of Guelph, Ontario. Held at Griff’s Georgetown, the doubleheader features your Grand Raggidy All Stars facing off against The Brute Leggers and Grand Raggidy Attack competing against The Rum Rollers. The last two meetings between these teams were white knuckle affairs as the All Stars prevailed 239-166 and 136-135, highlighted by poised blocking, primo communication, and aggressive footwork which allowed strong jammer penetration and breakthrough from the pack. Some of the best roller derby was played in those battles and one could be reminded of the old rivalry with Kalamazoo. However, the All Stars ascension through the ranks last year was due to their phenomenal play in the second half of the season as they tore their way through Philadelphia’s East Coast Derby Extravaganza (ECDX), rolling over Gothenburg, Long Island, and Maine. This was followed by the WFTDA Continental Cup, losing to Team United and defeating Royal City, finishing the final two road trips with five wins and only one loss, while allowing the All Stars to climb twenty four spots in the ranking to #57 in the world. With Royal City being ranked #53, expect them to come out with axes grinding and the scent of revenge. The previous meeting between Grand Raggidy Attack and the Rum Rollers occurred at Kalamazoo’s K-Town Shakedown last season, with the Rum Rollers coming out on top 310-85. Attack held onto key veterans and welcomed new blood who will provide a reinforced roster of competition to bring the heat. How have practices been and how has the team prepared for the season opener? Practices have been running well. We’ve tried to increase the intensity and consistency with our practices to make the most of our time together. This is the longest duration we’ve had to prepare before a season opener. This has allowed us more time to condition before concentrating on skills and drills. Hopefully by focusing on these core concepts early on, we will start the season off with the same intensity we have been bringing to practice. The last two meetings against Royal City were close scoring affairs and exciting to watch. What do you think they will bring to the table? I think Royal City is going to come into this game with an urgency we haven’t seen from them before. While GRRD has been victorious the last two games, Royal City is still ranked higher than GRRD. Being the higher ranked team the onus is on RCRD to really come out with a strong win to maintain their ranking. What do you feel are Grand Raggidy’s strengths going into this game? Our team is filled with veteran skaters with years of derby experience, but also a team comprised of athletes with very strong instincts on the track. Our defense has always been one of our strongest attributes, but with a deep jammer bench, and the ability to provide offense, our jammers offer a versatile line-up that I believe will be difficult for any team to adjust. What can Grand Raggidy improve upon as team? We always have areas for improvement. Patience and remaining present is important for our team to hone in on this season if we want to continue to climb in the rankings. Blocking was phenomenal last summer, specifically during ECDX and Continental Cup. Do you feel the team will be able to carry that momentum after the extended offseason? I believe our team has only become stronger in the recent months. One thing we’ve really been focusing on is our individual blocking. By increasing our individual skills we will only become stronger as a team. How efficient has the system been without a full-time coach? It has been a learning process. As far as training, practice, and our success at C-Cup we’ve proven we’re all driven enough to keep our eye on the prize. The downside is trying to balance relationships with our teammates while leading at the same time. Trying to keep track of all of the responsibilities and working on interpersonal relationships has been the biggest hurdle, but as far as efficiency it has definitely been worse. Any key injuries to players that may affect performance? Our team is healthy! *Knock wood* We have one teammate out on a short medical leave, but fortunately not due to an injury. We had a long off season that allowed many of our players to nurse nagging injuries and take the time to get our bodies healthy again. Hopefully with proper rest and cross training we can avoid as many as possible as the season moves in full swing.